Wake up time! Thanks to Crystal’s Make Over Your Mornings course, I am now an early-riser! I accomplish so much more each day when I can start the morning by myself — whether that’s working or just enjoying a cup of coffee in silence. 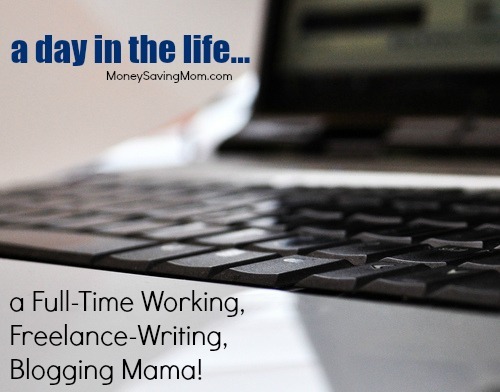 Once they’re asleep, I get to working on my side jobs — freelancing and blogging. I average about $1,500 per month on both of these combined and work roughly 10 hours per week. Sarah Brooks is a full-time employee, freelance writer and blogger, but most importantly she is a mom to two little girls, Cami and Maisie. She has a passion for helping moms follow their dreams and create a life that they love. Sarah and her family recently relocated from Arizona to North Carolina and they love exploring their new town. When she’s not working or playing with her babies, you can find her baking cookies, relaxing outside with a good book or binge-watching Netflix with her husband. Thank You for this post. This speaks to me in a big way as I also blog plus work as an instructional assistant at a local school 28 hours per week when school is in session. Thanks!